Two men charged over a $13.5 million ice seizure in Adelaide have been granted home detention bail. Antonio Tartaglia and Paul Bertus Blokland appeared by video link in Adelaide Magistrates Court on Wednesday charged with importing a border controlled drug. The court heard that both men were suitable for home detention bail with magistrate Paul Foley agreeing to their release on the condition they were electronically monitored. They will also need to surrender their passports and must not contact each other. Tartaglia, 46, and Blokland, 51, were arrested last week after the seizure of 18 kilograms of methamphetamine which was hidden in 4WD winches shipped by air to Adelaide from Malaysia. The Australian Federal Police said the seizure would take 180,000 deals off the streets and believed the group importing the drugs had bikie gang connections. 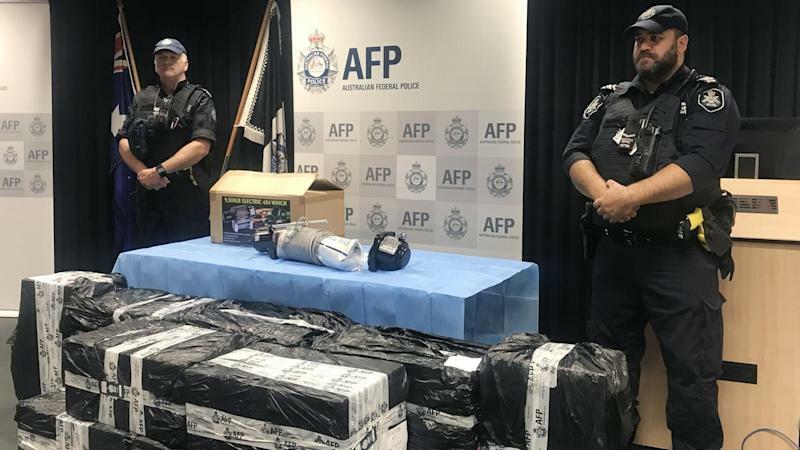 "We believe a very well resourced criminal syndicate is responsible for this importation and that this meth was targeting South Australians," AFP Superintendent Gail McClure said. "We have seen similar importations previously yet the syndicate has made no effort to change their concealment method." Before his arrest, Blokland had been spoken to by authorities at Perth airport after arriving on a flight from Bali. He was considered a person of interest and his arrival prompted the investigation of air cargo consignments linked to him. Also seized by police during last week's raids on two properties were $13,000 in cash, a cash counter, scales, electronic devices and travel documents. Tartaglia and Blokland will return to court in April.